Has the Coalition turned around Australia's emissions deficit by 1.1 billion tonnes? The Morrison government for months argued Australia is on track to meet its international greenhouse gas emissions abatement targets “in a canter”. 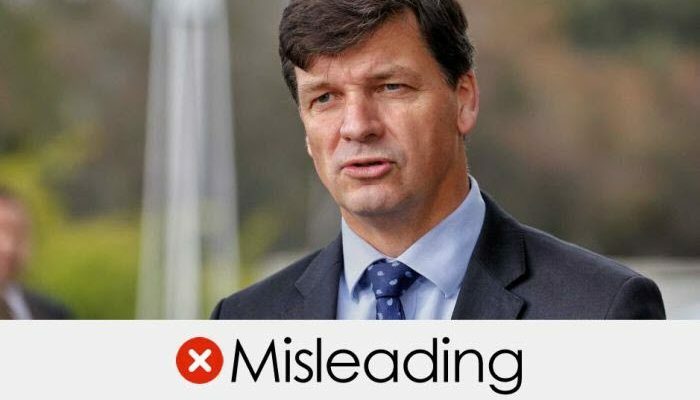 In an interview on ABC’s Insiders, Energy Minister Angus Taylor said when the Coalition came to power it inherited a 755 million-tonne emissions “deficit” needed to reach Australia’s second Kyoto target because Labor “hadn’t done the hard work”. “We have turned that around by 1.1 billion tonnes,” Taylor said. In the same interview, Taylor said emissions are “coming down right now”. Has the Coalition, through its “hard work”, turned around an emissions deficit inherited from Labor? And is it correct to suggest emissions are heading down? When the Coalition came to power in September 2013, the most up-to-date projections available were from a Department of Climate Change and Energy Efficiency report almost a year earlier. The figures Taylor cites are consistent with forecasts contained in that report and another released in December last year. However, Taylor’s characterisation is problematic. First, the 2012 emissions data used by Taylor was superseded by a new report three months after the Coalition came to power. Its forecasts also factored in estimates of abatement to be achieved by Labor’s carbon tax. For this reason, Fact Check considers the 2013 report provides a more accurate, and less pessimistic, snapshot of the situation that the Coalition “inherited” from Labor. In addition, the 2013 report accounted for a significant “carry-over” of emissions credits from Australia’s over-achievement of the first Kyoto period, which ended in June 2012. The inclusion of the carry-over, which was not factored into the 2012 estimate cited by Taylor, reflects an accounting assumption, rather than any “hard work” on the part of the Coalition in reducing emissions. Furthermore, in 2012 and 2013 the department dramatically underestimated the extent to which electricity sector emissions would moderate. As experts consulted by Fact Check noted, the unanticipated fall in electricity emissions was the result of rising wholesale prices for electricity, the closure of big, ageing coal-fired power stations in Victoria (Hazelwood) and South Australia (Northern and Playford), and investments in renewable energy. Taylor is not entitled to claim credit for emissions reductions achieved through state-based renewable energy incentives or through the closure of coal-fired power plants, given Coalition criticisms. Changes to land use and the impact of floods and drought on agricultural emissions also had an impact. The Coalition’s “Direct Action” emissions reduction fund also played a modest positive role, according to experts. Meanwhile, emissions under the Coalition have risen for four of the past five years, and are higher today than they were in 2013. According to the department’s latest predictions, they will be higher still in 2020, under current policy assumptions. Australia has signed several international climate change agreements in recent years. The first Kyoto target,adopted at a conference in Japan in 1997, aimed to keep Australia’s greenhouse gas emissions at 108% of 1990 levels, on average, between 2008 and 2012. Australia did better than its target by 128 million tonnes. A second Kyoto target, negotiated in Doha, Qatar in 2012, requires Australia to reduce emissions to 5% below 2000 levels by 2020. Finally, the Paris climate agreement, of December 2015, requires Australia to reduce its emissions to between 26 and 28% below 2005 levels by 2030. All the years referred to are Australian financial years, ending on June 30 of the year quoted. The second Kyoto target, referred to by Taylor in his claim, relates to emissions in the year to June 2020. According to the department, emissions would need to be 524 million tonnes in 2020 to reach the second Kyoto target of limiting emissions to 5% below 2000 levels by 2020. However, the department has not tracked Australia’s progress simply in terms of whether emissions have been falling towards that figure year by year. Rather, it adopted a more sophisticated methodology, which is set out in Appendix A of its most recent emissions projections report, published in December 2018. Its approach has been to chart a straight line from the middle of the first Kyoto period (2010) to the end of the second Kyoto period (2020) and measure the area underneath this line to create an “emissions budget” for the period 2013 to 2020. The cumulative effect of this emissions budget is that Australia is limited to emitting almost 4.5 billion tonnes of carbon dioxide equivalent in total over the eight years up to and including 2020. As the department explained in its 2015 emissions projections report, in some years Australia’s actual emissions could be higher or lower than the target budget for a particular year. 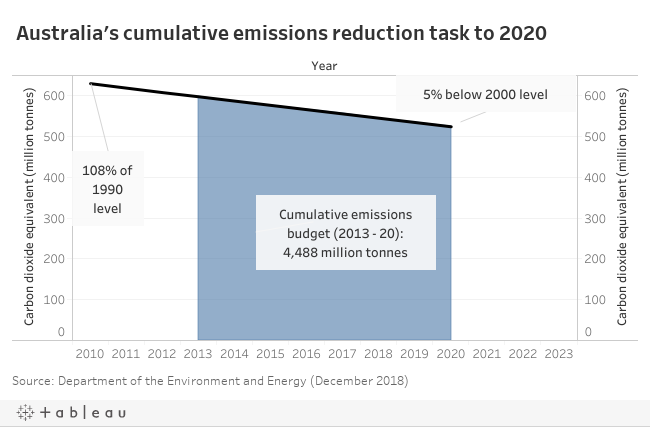 In terms of achieving the 2020 target, what matters — as the department see it — is whether cumulative actual emissions between 2013 and 2020 turn out to be 4.5 billion tonnes or lower. The department periodically updates its forecasts for the period remaining until 2020, and uses these forecasts and actual emissions to date to measure Australia’s progress against the emissions budget for the eight-year period. That confetti of confected crap that Fraudberg was tossing around on Q&A – Monday night – was that Fact Checked according to their “promo”?